be of the absolute highest quality, as we only allow fully trained and certified Bauder approved contractors to install our roofing systems. Excellent workmanship is crucial to the guarantee that accompanies Bauder installations and so we have always operated a policy to train and approve the individual installer, and not simply the contracting roofing company. Each individual fixer is required to display their approved operative badge at all times showing photographic identification, name, badged operative number and the systems that they are trained to install. are progressing. We have the largest team of site technicians across the country which shows just how committed we are to quality. Our range of guarantees offer total cover for design, products and workmanship and are not reliant on the size of the roof. We issue them unreservedly on all projects because we monitor quality every step of the way from manufacture to installation, giving you total reassurance over the future performance of your building's roof. Once your roof project is on site, our experienced site technicians monitor the works as they progress, inspecting the installation and providing periodic reports. Our national team is the largest of all the manufacturer-suppliers, ensuring all our sites receive the attention they deserve. 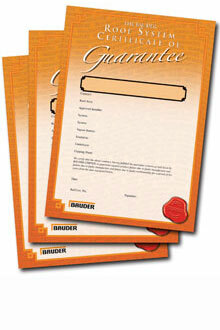 We offer a comprehensive range of guarantees to suit all projects and requirements.